The University-Tomorrow Research Laboratory for the Twenties conducted survey in 2013 among 4,000 university students. It revealed that more than 40 percent of the respondents believed King Sejong was the person who left the most significant legacies in Korean history. 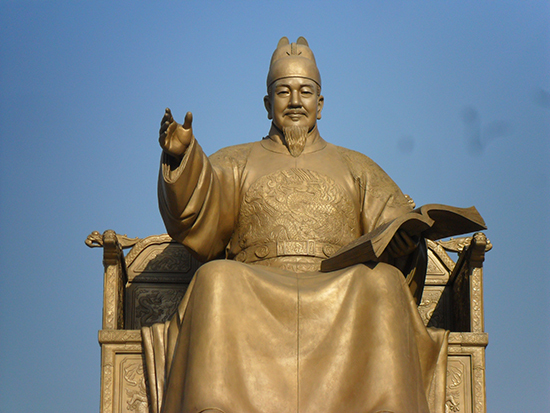 October 9th is the 568th Hangul Proclamation Day, the only day that is designated to pay tribute to his achievement. He made the Hangul alphabet to improve literacy, to guide his people, and to share information with the whole nation. Also, since the 1960s, Hangul has received various recognitions from several nations. According to the newsletter of the National Institute of the Korean Language, Hangul is the world’s 13th language in order of adopters. Also, from 2010 to 2013, the number of schools abroad which teach Hangul increased from 525 to 799. Of course, this means the number of students of the language increased as well from 39,435 to 76,377. This is because Hangul is the most unique and scientific alphabet. Hangul is the only alphabet made in less than a decade, without any influence from other. It is also made by one ruler, and published with its grammatical system. The United Nations Educational, Scientific, and Cultural Organization (UNESCO) acknowledged this fact and have started to praise it by including the Hunminjeongeum, the Korean script, in its Memory of the World Register List. Additionally, it established the King Sejong Award, which recognizes a person or an organization that contributes to the crusade against illiteracy. The 2014 award winners were the Association for Promoting Non-Formal Education in Burkina Faso and The Ministry of Education of Ecuador. The Association educated 1,800 illiterate women, and the Ministry operated a project named “Basic Education for Youth and Adults.” They are both planning to visit Korea this October to celebrate the award and to experience Korean culture. Furthermore, Hangul is scientifically the most perfect alphabet according to Oxford University’s Department of Linguistics. It was made to resemble human’s vocal organs including tongue, teeth, and the roof of the mouth. Additionally, it is an orderly and relatively error-free system. This was possible because it is the only set of characters that came with an example and grammar book written by the inventor. Hangul is also the most proper alphabet for spoken languages that do not yet have a written-form. UNESCO selected Hangul as the alphabet for about 2,900 spoken languages in part of their Babel Project. This project is run to prevent the extinction of minority languages. Finally, on July 17th, the International Telecommunication Union (ITU) officially adopted the Korean Chun-Ji-In keyboard as one of the global standard alphabets. It is the first among non-Latin-based alphabets. If a keyboard becomes a global standard, it can be freely set in devices made by international factories. However, to keep pace with the rising international status of Hangul and to welcome the Sejong Prize winners who will visit Korea in October, we should first reflect on the present state of our attitude towards Hangul. Hangul is highly recognized in the world, but its users often forget its importance. Foreign languages, especially English, are used too often and even have a higher status than Hangul in governments, companies, and universities in Korea. Also, most Koreans are unable to use Hangul properly. When it comes to the Korean preference for English, firstly, Korea’s governmental departments frequently use English words in their news releases, policy announcements, and reports. According to research conducted by the Hangul Cultural Band in 2013, 8,842 unnecessary foreign words were used in governmental documents and this is 2.88 times per documents. Also, foreign loanwords were used 10,451 times, and this is 3.6 times per documents. These were increased by about 1.6 times since 2012. Additionally, Korean companies use foreign or loanwords in their brand names to make them seem like imported goods. In 2010, only 31 percent of apartment names were written in Hangul. Earlier this year, the Korean Business Association pushed for the abolition of a regulation which prohibits food packing design from writing foreign words bigger than Korean ones. Finally, in universities, Hangul is gradually losing its footing. Dongguk University scholarship criteria include official English test results but it does not include results for a Korean one though. Also, recently, Pai Chai University in Daejeon has eliminated its Department of Korean Language and Literature. The university announced that it was to raise the employment rate by focusing on an increase of students’ competitiveness among English and foreign languages. This overall tendency is due to the English preference of companies. A survey of 185 company human resources managers conducted by the online employment portal Saramin found that more than 67 percent of them preferred applicants with high English test results. However, less than five percent of them wanted one with a demonstrated ability in Hangul. Though the Korean illiteracy rate is less than 1.2 percent, the degree of understanding is remarkably low. As university students, we can deal with the above situation in three possible ways. First, learn basic knowledge about Hangul. It can be a great help when we are checking ambiguous and questionable expressions. Call 1599-9979 for questions about Hangul usage. It is an official number run by the National Institute of the Korean Language. Also, reading books and other materials written in Hangul can help. According to the Ministry of Education and Human Resources Development, in 2012, Korean university students borrowed 9.6 books on average from their school library, which is a significantly low rate compared to North America, where students average was 15. The second way is to minimize the use of loanwords. This does not mean to eradicate all loanwords from daily usage; however, try not to use unnecessary ones. The National Institute of the Korean Language chooses four loanwords every month that can be replaced into Hangul words. In September, sinkhole, canopy, synergy, and personal training were altered. On October, the chosen words were gardening, tumbler, eco-bag, and flea market. Last but not least, we can promote and advertise correct usage of Hangul. It is important not only to remind ourselves of the correct usage but also to inform others. Actually, there is a club named ‘Nuribom’ at Dongguk University, which informs proper Hangul usage to people. Current university students should have the above attitudes because, firstly, they are the only age group that maintains those attitudes. In terms of age group, teenagers do not have social influence, and elders are busy with their careers. University students, however, can make group work and influence others easily. This is because they can frequently meet at school and are socially recognized as adults. Secondly, they need to write academic essays. Academic writings that university students are required to do must be based on a proper understanding of Hangul. Universities are the place of true learning, and places where future leaders gather. Thus, it is necessary for students to express their thoughts and feelings in an ordered form so that the reader can understand the exact meaning. However, if they write in poor Korean, it can be hard to exchange information. Finally, they are the last age group that will have the opportunity to receive a proper Hangul education. They can rarely receive Hangul education after graduation. In universities, students can be exposed to many types of Hangul documents and reading materials; reference books, research papers, theses, and books. These are also written in proper Hangul format. However, after graduation, it may be hard to find the time to read deeply in such text. Therefore, it is important to at least have the right attitude toward Hangul during university. Chung Woo-young, a professor in Dongguk University’s Department of Korean Language and Literature, said, “In today’s information era, since Hangul used mostly in the internet and smart phones is reflected on university students’ writings. Thus, they abandon the opportunity to use elegant and rich pool of Hangul. If they try to learn Hangul with one-tenth of the effort they put into English, the language use in our daily life will improve remarkably.” To celebrate 568th Hangul Proclamation Day, and to appreciate out unique alphabet, university students should think deeply about the true meaning of proper language use. Huh Da-mi, Lee Hye-jin, and Jung Hye-jin, who are all seniors in the Department of Education at Dongguk University, were shocked when doing their high school teaching practicum. Hangul and the Korean language were frequently misused in classrooms. Afterwards, they decided to launch a club to introduce to others proper form of language and usage of Hangul. Q: Can you explain your past, present and future activities? A: On July, we researched examples of misusage of Hangul in daily life. For instance, we looked at TV programs, signs, newspapers, and advertisements. Koreans use too many loanwords even when unnecessary. ‘Delivery service’ is a great example. On August, we went out to the Han River and ran a Hangul related quiz program with Seoul citizens. On September, we made our activities into video clips and uploaded them on the web. We will launch a booth at Gwanghwamun Plaza and will teach citizens proper Hangul rules through plays and face painting. Q: What do you think about overall Hangul usage among Koreans? A: We three are all students of the Department of Education, so we all had to do a teaching practicum. During that time, we realized that there are lots of things to be corrected. In our July and August activities, we were surprised by the number of errors that common people usually make without noticing it. We do not think we ourselves are using Hangul properly. We are at least trying to notice it and correct it, whereas most Koreans do not. On the other hand, there are some good examples. In Insadong, the Starbucks coffee shop’s sign is written in Hangul. Q: Can you tell us attitudes toward Hangul that university students should have and why? A: Languages and characters do change as time passes. This has always been true, and will continue to be true. When we distort our language and character just for fun, it will become fixed, and our descendants will believe it as the proper form. To prevent this, university students need a turning point. Our one was teaching practicum. Therefore, we started this club activity. We hope that the people we met during our Hangul-informing activities can think of us as their turning point. ▲ Nuribom club members are gathered in in a park near Han River, after running a Hangul related quiz program with Seoul citizens, Most of the citizens find themselves repeating the same errors when using Hangul in their daily lives.